36 percent of locals surveyed say they prefer to get news from local TV. Online news is closing in on local television as the preferred way that people nationwide get local news, according to a Pew Research Center study of news consumers released Tuesday: 41 percent like TV best, compared with 37 who go digital first. The study includes a nifty tool that lets you see trends in news consumption in your area: In our case, the large metropolitan statistical area that includes stretches from Frederick County, Maryland, to Spotsylvania County, Virginia, and from Jefferson County, West Virginia, to Calvert County, Maryland. TV still reigns in this region: 36 percent of adults say they prefer to get news from the biggest screen in their homes. News websites were tops for 27 percent, and print media were a distant third at 14 percent. 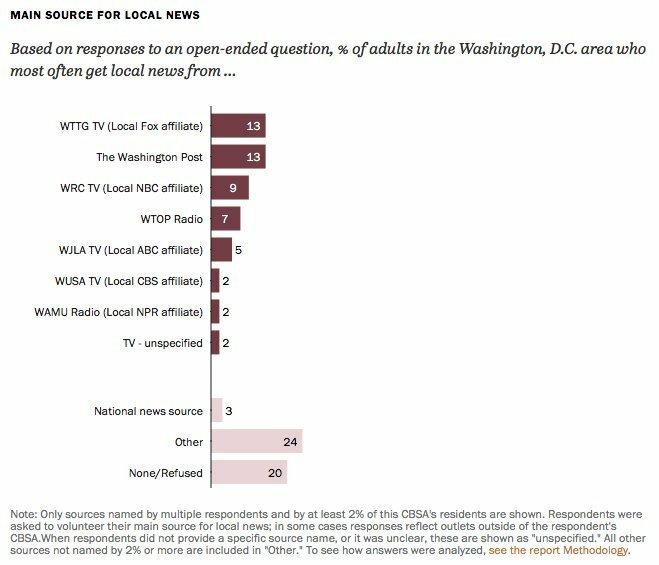 The top outlets for respondents to get local news were WTTG-TV and the Washington Post. WRC-TV was third, followed by WTOP-FM, the preferred source for as many people as WJLA-TV and WUSA-TV combined. 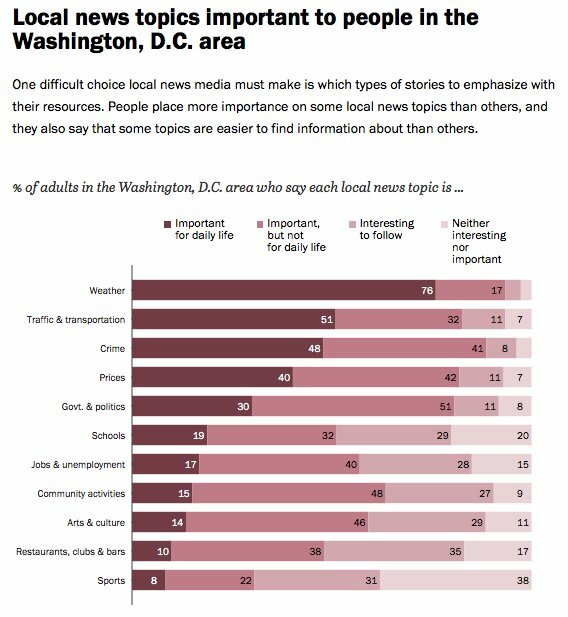 WAMU-FM was the top source of local news for 2 percent of respondents. (My deepest hope is that Washingtonian is part of “Other”). Weather was the most important subject of coverage for more than three-quarters of respondents, followed by traffic, crime, and “Prices”–“news about changing prices,” the full report explains. Huh. Anyway, 64 percent said local journalists “are in touch with the community,” 60 percent said local news media “do not have much influence,” and 82 percent said they’d never spoken with a local journalist, which seems remarkable in such a media-worker-saturated region, but could reflect that lots of journalists here are on national beats. Perhaps most interesting, at least to someone employed by a publication to which one can subscribe, is that while a strong majority said local media do a good job of keeping them informed about important local stories, and 87 percent said they were very or somewhat confident in the ability of local news sources to get them info, only 16 percent said they’d paid for local news. I agree with my former coworker Rick Edmonds at the Poynter Institute, who reckons that few cable subscribers are aware their bill makes it possible for cable companies pay “carriage fees” to local stations–a significant part of those outlets’ revenue.